Self-contained flat situated in one of the prettiest and quietest streets in fashionable Notting Hill. Just minutes away from many trendy boutiques and restaurants in Ledbury Road and Westbourne Grove, with alfresco dining at pavement tables in summer months. One of London’s main centres for antiques, with the famous Portobello Road market only 8 minutes walk. Hyde Park and Kensington Gardens also in easy reach by foot. Small Sainsburys supermarket just round the corner, and Whiteleys shopping mall with multiplex cinema 8 minutes away on foot. Well-equipped flat with wireless broadband internet access, phone, TV etc - large fully equipped kitchen with double oven and microwave. Pretty little patio garden. With spacious kitchen and eating area for 2. One week minimum stay. French windows onto patio garden. Linen, pay phone, T.V hot water etc all inclusive. Internet access (wireless broadband). Within easy reach museums, theatreland, Portobello Market etc. Nearest tube: Notting Hill Gate (10 minutes walk). Buses to all parts of London 2 minutes walk away. The bathroom has a bath with a hand held power shower.attachment. Hard to use due to sloping ceiling. In spite of the above it was a great place to stay. Quaint garden apartment in charming neighborhood, perfect location. 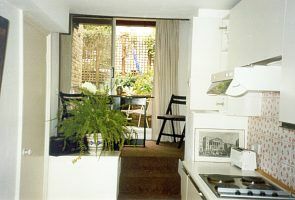 The apartment is perfect for 2 people and is in a great location. Easy walk to Hyde Park, Notting Hill Gate tube station and minutes from our favorite food spot in London - Ottolenghi! We didn’t cook or eat in, but the apartment has everything you need to do so. There are cute stores and other good restaurants close by too. We didn’t meet Val, but she was so easy to communicate with and we had no problems at all. Highly recommend staying here! The property was sweet and lovely....just a little smaller in space then we expected. Great location and very comfortable neighborhood. Easy access to Hyde Park and all around there. We highly recommend! Notting Hill is a fashionable area just north-west of Hyde Park. It is within easy reach of all parts of central London. Walking distance from famous Portobello Market.